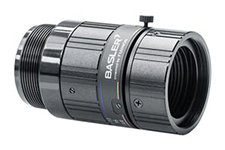 This Basler C125 25 mm lens is ideal for installations where a smaller field of view, or a longer working distance, is what's needed. Basler and Fujinon have teamed up to manufacture this lens for cameras having small image sensors. It is an especially good choice for cameras having small pixels. The lens is compatible with many C-mount cameras having a 7.3 mm diagonal sensor, or smaller. Note this lens has long mounting threads that are compatible with Basler ace cameras, but may preclude use on cameras having a shorter lens mount. Use the LSBR900 5 mm spacer ring to mount this lens on the Basler pulse camera, which has a CS-mount. CMOS image sensors have been getting smaller and smaller, while their resolution has been increasing. The result is small pixels, and these small pixels demand a high resolution lens. Many lenses on the market today were designed a long time ago for much larger pixels. These old lenses can produce images having poor contrast between image details. This Basler lens offers a resolution of 230 lp/mm, delivering crisp images even with pixels just 2.2 microns in size. This compact lens is just 29 mm in diameter. Not coincidentally, the same size as the ace camera! It features locking screws for both the iris and focus. An orange dot indicates the ideal aperture setting for the sharpest images. Like the Basler ace, pulse, and dart cameras, this lens was carefully engineered to deliver great value. It has less glass than lenses intended for larger image sensors. It was optimized for working distances typical of machine vision installations. And we're happy to offer it at a great price. Small quantities of this item can be returned to us for credit. Items must be clean, unused, in new condition, and in the original packaging. The packaging must also be in new condition and with all original materials. A 25% restocking fee will apply.